How to use Nuvo Drops! Nuvo Drops are a fantastic self-levelling liquid that can create stunning enamel or glitter effects when added to a project. When Nuvo Drops are squeezed onto a surface they create a dimensional element with a smooth, enamel-like finish. They’re a great way to add some fun detail to your projects. Just keep in mind, drying time varies from 1 hour to 3 hours, depending on the surface applied. To avoid smudges or accidents set your cards out of reach until dry. 1. Squeeze a little liquid onto a scratch piece of paper to make sure the flow of the liquid is steady. 3. Lift the bottle straight up once you’re done squeezing. If your drop is shaped like a peak, no worries, it will level out as it dries. 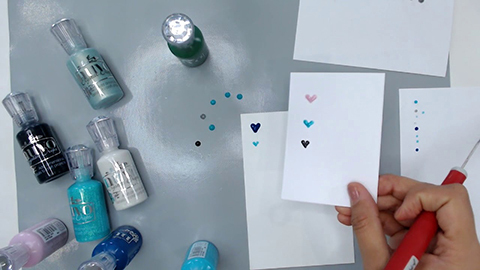 Use either wax paper, a non-stick craft mat, or a glass mat to squeeze some dots onto your surface. Allow 1-3 hours to dry. Gently remove dry enamel dots and store in a cool place for later use. Squeeze two dots of the same size onto your surface. Make sure the dots are placed pretty close together. Use either a pin or die pick to drag the liquid of both circles downwards to meet at the centre. Allow to dry. Use 2 to 3 colours to create a colour pattern row of dots. You can use as many colours as you like. Take a pin or die pick and drag the tip down the centre of the row of dots. This will give you a chevron, almost braided effect. Allow to dry. Squeeze an Oyster Grey dot onto your surface. Then squeeze a smaller dot of Ebony Black directly on top in the centre of the Oyster Grey drop. Once dry this will give you an eyeball shape!